Bitcoin price recovered slightly, but upsides are capped near USD 6,500. Ripple corrected above USD 0.280, but it is struggling to break USD 0.30. MCO and HOT gained traction recently and climbed around 12%. After a nasty decline, bitcoin found support above the USD 6,250 level. BTC/USD recovered above the USD 6,400 resistance, but it faced a strong resistance near USD 6,500. Similarly, there were minor upward moves in major altcoins like ethereum, ripple, bitcoin cash, neo and litecoin. However, it seems like recoveries are facing hurdles and sooner or later sellers are likely to come back. Bitcoin price found support near the USD 6,250 level and corrected roughly 1%. BTC/USD broke the USD 6,350 and USD 6,400 resistance levels, but it failed to settle above the USD 6,500 resistance. There are also technical resistances formed near USD 6,550 and USD 6,600. Therefore, as long as the price is below USD 6,500 - USD 6,600, it remains at a risk of a fresh downside push. Should buyers manage to push the price above USD 6,500 and USD 6,600, the price could recover towards the USD 6,800 resistance. On the other hand, a break below USD 6,400 might take bitcoin back towards USD 6,250. Ethereum price corrected above the USD 225 level, but sellers appeared near USD 230. ETH/USD is currently (UTC 08:30 AM) sliding towards USD 220 and it seems like it could retest the USD 210 level. If there are more losses below the USD 210 level, the next stop could be USD 200. On the upside, there are many resistances near USD 230, USD 232 and USD 235. Bitcoin cash price traded above the USD 500 level and tested the USD 525 resistance. BCH/USD is currently up 2% to USD 510. The pair must clear the USD 525 - USD 530 resistance for more gains towards USD 540 and USD 550. On the downside, below USD 500, the price may retest USD 480. Ripple price traded nicely and moved above the USD 0.280 and USD 0.290 levels. However, XRP/USD struggled to settle above USD 0.300 and it is currently declining towards USD 0.280. Recently, a few small cap altcoins staged a decent recovery and corrected between 8%-15%, including MCO, HOT, PPT, ONT, GAS, NANO, WAX, ZEN and DCR. On the other hand, BCD, BTCD, DROP and BTCP extended slides by roughly 7%-10%. Overall, the current correction wave is losing steam, which means bitcoin could resume its decline if sellers clear the USD 6,400 support. 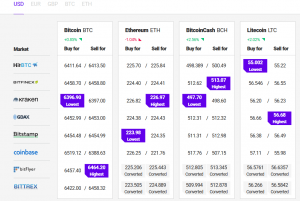 More importantly, a break below the USD 6,250 support may possibly put a lot of pressure on BTC/USD and altcoins like ethereum, bitcoin cash and litecoin.